You've probably muttered this line after a string of poor golf shots. It's an all-too-common refrain. Even worse is when a playing partner pipes up with his own diagnosis of your issues, which causes more distress when the advice turns out to be faulty. One thing all consistent players have in common is a fundamental understanding of their own swings. You'll rarely see good golfers completely lose their games for a long stretch of holes, because they're able to correct mistakes on the spot. If they hit a big slice with the driver, they usually know why, and adjust accordingly on the next tee. The first step to becoming a proficient self-corrector is learning the basic causes of your most common mishits. For instance, if you have a tendency to hit the ball thin, figure out why – and what to do about it. Then you'll have an answer when thin shots crop up during a round. Focus on fundamentals: More often than not, a game gone haywire can be traced back to a very simple issue, such as misalignment. After a bad shot, keep your feet in exactly the same spot as address and place your club on the ground, touching the toes of both feet. Step back and look at where you lined up. If it was off target, you're probably making the same mistake each time. Improper ball position gets many golfers, too. Check this by laying the club from your tee or the back edge of your divot to your feet, keeping the shaft perpendicular to the target line. You may find that you addressed it in the middle of your stance rather than off the front foot, or vice versa. The direction and depth of your divots may offer clues to alignment and swing path as well. Get your tempo in-sync: Maintaining your ideal rhythm over the course of 18 holes is difficult, even for great players. When suffering through a spell of bad ballstriking, step aside while others are hitting and make a few slow, easy practice swings with your feet close together, concentrating on keeping your balance. This will bring your rhythm back to an even keel. Golf is a game of corrections. It would be great to be able to head out onto the course knowing that your swing is going to feel the same over all 18-holes – but that just isn't how this works. Your swing is constantly evolving based on a variety of factors, and you have to be able to adjust to keep up. Many people think that the player with the best swing is the one who will come out on top in a tournament, but that is often not the case. Rather, it is frequently the golfer who does the best job of making adjustments from one hole to the next who will card the lowest score. The difficulty with learning how to make in-round corrections comes in the fact that they are rather subtle in nature. You aren't going to completely overhaul your entire golf swing in the middle of the round, of course, so the adjustments you make usually come down to something minor in your stance, grip, posture, etc. These changes would be completely invisible to anyone watching from the outside, so only you will know that an adjustment has been made. You should always strive to make as few adjustments as possible while keeping your game on track, but even the best players have to tweak their technique as they go in order to achieve good results. If you work with a golf teacher to improve the mechanics of your swing, you have to be careful to understand all of the moving parts involved so you can make corrections on your own. It is a great idea to work with a teaching pro, but never forget that this is your golf swing and you need to own it completely. Your teacher is not going to be there with you out on the course, so he or she will not be able to give you the tips required to get your game back on track right away. Instead, that job is going to fall to you, so an in-depth understanding of your mechanics is required. During your lessons, be sure to ask plenty of questions of your pro so you can understand the technique you are being taught. Specifically, ask about how you can correct your swing when things start to go a bit sideways. While the title of this article alludes to making swing corrections during the course of a round, you also need to be able to make strategy changes along the way. Later, we will provide some direction on how you can correct any strategic mistakes you are making on a given day before it is too late. With the ability to adjust both your physical mechanics and your mental game on the fly, you should start to post lower scores in the near future. All of the instruction below is based on a right-handed golfer. If you happen to play left-handed, please take a moment to reverse the directions as necessary. No golfer plays at his or her best during every single round. This is an extremely challenging game, and everyone has off days. Simply having an off day may not mean that you have corrections to make to your swing, as your problems could be related to non-swing issues like weather, course management, pressure, etc. So how do you know when you are just having an off day and when you actually need to make some corrections during the round? The following points should help you understand the difference. Changes to your ball flight. This is usually the first sign that you need to correct something within your technique to get back on track. If the shots you are hitting do not match up with your typical ball flight pattern, something has obviously gotten out of position within your swing. Even when you aren't having a great day, you should still be hitting the ball with your usual pattern – unless your technique is off. When you find that most of your shots are flying with a surprising ball flight, there is a good chance you will need to make a quick change to restore order to your game. For example, if you consistently play a draw with all of your clubs, and today you are hitting a fade, there is a correction to be made. Your ability to find the necessary correction before too much time has passed will determine your score for the day. Missing distance. When you find that your shots are not traveling their normal distance – and there is no environmental reason for the change – you probably need to correct your technique. Before you make any correction, however, be sure to rule out other causes of the missing yardage. For instance, the ball will not fly as far as usual on a cold day, so think about the weather and decide if it could be cutting down on your distance. Also, the ball flies shorter at lower elevation, so you may not be hitting your shots as long if you usually play at a high elevation and have come down closer to sea level for the day. Once you have ruled out external factors, you should begin to look within your swing to see where those extra yards may have gone. Poor quality of contact. This is another sure sign that something is off within your technique. If you are struggling to find the sweet spot, especially with your irons, there has likely been a minor change in your mechanics which will need to be put back into order. Clean ball striking is one of the main keys to playing good golf, as it is extremely difficult to get around the course in a good score without the ability to find the sweet spot at impact. All golfers miss-hit the ball from time to time, so be sure not to overreact to a single poor shot. However, if you notice a pattern of poor ball striking within the first few holes of the round – or even on the range before the round – you should start looking for solutions right away. The key to making effective in-round corrections is to act quickly before your score spirals out of control. Waiting too long to adjust your swing could result is several bogeys or double bogeys before you find your way. As there are only 18-holes during a round of golf, you can't afford to spend several of them in search of your swing. Do your best to make quick and decisive corrections in order to save your score before it's too late. As was mentioned briefly above, you can even begin to notice problems when they come up on the driving range prior to the round. Pay attention to the quality of your swing on the range, and start the process of making corrections right then and there if necessary. If you can check off your corrections before walking to the first tee, you should be able to start the round with confidence. The challenge with writing an article on how to make in-round corrections is the fact that all golf swings are unique. There is no way that you can be told exactly what corrections you need to make by someone who has never seen you swing the club. You have to know your swing if you are going to make these corrections, and there is no one else who can do that work for you. With all of that said, we can provide you with a list of likely fixes where you may be able to start your search for a solution. The list below includes some basic ideas for adjustments you can make to your technique when things start to go off track. These changes are common tactics that experienced golfers use when they feel like their swing is getting out of line. Review the list below and keep these points in mind during your upcoming rounds. Take more time at the top. This is a classic in-round adjustment, and one that tends to lead to great results. Often, when you get out of sorts on the golf course, it is because you are rushing through your swing. By simply thinking about taking a little extra time to transition from the backswing to the downswing, you just might be able to get everything to fall back into place. This is usually the adjustment required when golfers say that they are unable to take the same swing they use on the range out to the course. There is no pressure on the range, so you take your time and produce a great swing. During your rounds, you may get a little nervous and rush as a result. Make an effort to slow down the overall tempo of your swing, especially at the top, and nice results may be right around the corner. Choke down on the club. Most amateur golfers would not think to make this adjustment, but it can be a great way to simplify your swing when your mechanics are giving your trouble. By choking down just an inch or so off the top of the grip at address, you will make a shorter swing and it will be easier to stay on balance. It should be noted that this adjustment will usually lead to shorter shots overall, so you will need to tweak your club selection appropriately. This tip can work for every club in your bag, from your driver on down to your short irons. Once you feel that you have gotten back on track thanks to the use of this technique, you can work your hands back up to the end of the grip to regain your full distance potential. Move the ball back in your stance. Often, this is an adjustment which will go along with choking down on the grip of the club. By moving the ball back in your stance slightly, you will make it easier to control your trajectory – and you should do a better job of keeping the ball in play. Again here, you will lose some distance when you take this approach, but that is a trade you should be willing to make. When you do play shots with the ball slightly farther back in your stance, focus on controlling your balance and swinging with an even tempo. Just as was the case with the previous point, you can return to your normal ball position once you feel your confidence and rhythm start to return. Focus on a smooth takeaway. Getting your swing off to a solid start is extremely important. If there is a problem in your takeaway, the rest of your swing will be thrown off as a result – and you may never recover. Commonly, amateur golfers will struggle with their takeaway because they use their hands too actively to start the swing. To correct this problem, focus on using only your shoulders to turn the club away from the ball. Basically, you are going to start your full swing just like you would start your putting stroke – by keeping your hands and wrists quiet while your shoulders turn. Then, as the backswing develops, you can get your hands involved and set the club up at the top. It is easy to get off track with your takeaway from time to time, so return to the basics of this key swing component and you may find your game once again. There is a good chance that some of the fixes offered above will not apply to your game. For instance, you may have a rock-solid takeaway which never needs any correction. Or, your tempo may be excellent, even when you are under pressure. Whatever the case, you are going to need to think about these points with specific regard to your own strengths and weaknesses. It shouldn't take long to figure out which of these ideas has the potential to help you during a round, and which should be left behind. It is great to be able to make corrections to your swing during the course of a round. However, it is even better to avoid the need for those corrections in the first place. All golfers will have to make in-round corrections on occasion, but you would like to make those occasions as rare as possible. If you can manage to build your swing in such a way that it is reliable round after round, you may find that your mechanics rarely need any kind of adjustment. With that in mind, we have highlighted some important points below to keep in mind while working on your technique. Do your best to emphasize these points in your swing and you should achieve impressively reliable performance. Balance. Anytime you are talking about the consistency of your golf swing, it is your balance that will be the first topic of discussion. By swinging with excellent balance, you can deliver the club into the back of the ball the same way time after time. It is not a coincidence that the golfers on the PGA Tour all feature excellent balance in their swings – they know this is a key fundamental which is not to be ignored. While balance alone isn't going to lead you to great results, it certainly does make this game a lot easier. When on balance, you will find that it is hard to hit the ball too far off line. During upcoming practice sessions, focus on your balance to take your consistency to a new level. Limit moving parts. Simplicity is the name of the game in golf. By taking as many moving parts out of your swing as possible, there will be fewer ways in which your technique can go wrong. Take a moment to review your swing on video and look for any moves which seem to be unnecessary. If you can eliminate all motion which is not necessary to send the ball toward the target, you will be able to depend on your swing to hold up even in tough conditions. Swing at less than 100%. Many amateur golfers think that they need to be swinging at 100% effort on each and every shot. That simply isn't the case. If you can teach yourself to play most of your shots at something less than maximum effort, your consistency will improve dramatically. Players at the top of the game don't swing flat out on every shot, and you shouldn't either. A simple, balanced, controlled golf swing will take you a long way in this game. Swinging in this style might not be as 'flashy' as whipping the club around you at top speed while falling off balance, but doing things the flashy way in golf is a recipe for failure. 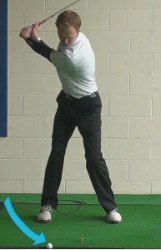 Work on controlling yourself and the club at all points during the swing to achieve solid results. As mentioned in the introduction, the task of making adjustments on the fly is not just about mechanical elements in your swing – it also has to do with strategy. When you notice your game is failing to live up to its normal level, you may need to tweak the way you approach the course in order to shoot the best possible score given the circumstances. Many golfers struggle with this concept, stubbornly playing the same way all day long even if it isn't working. Don't fall into that trap. Use the tips below to alter your strategy on the fly and you will shave strokes off of your average score. Play away from the flag. The first thing you should do when you notice that your game is a bit off is to aim away from the flag on most holes. When selecting a target for your approach shot, give yourself some margin for error by playing to the wide side of the green. For instance, if the flag is cut close to the right edge of the green, play your approach out to the left in order to increase your odds of finding the putting surface. This strategy will make it easier for you to hit greens, and it will leave you with easier chip shots should you miss – since you will be on the wide side, rather than being short sided. Put away your driver. This is another point which is hard for most amateur golfers to understand. If you are struggling with your swing, the last thing you want to do is launch the ball high into the air – as you probably don't know where it is going to go. Instead, club down on the tee and focus on control. You will leave yourself with longer approach shots using this method, but the trade will be worth it in the end as you will play more frequently from the short grass. Focus on staying below the hole. You should have this point in mind anytime you are playing golf, but it becomes especially important when you are struggling with your game. By paying attention to the low side of the hole – and then aiming in that direction whenever possible – you will leave yourself with more and more uphill shots. It is almost always easier to play uphill in the short game than it is to play downhill. You aren't going to be able to put the ball below the hole 100% of the time, but seek to maximize the frequency with which you find this favorable position. Golf might be a slow game, but you can't be slow to react when your game loses its way. Take action quickly when you spot a problem to avoid wasting too many shots. Golfers who are able to adjust right away will consistently post better scores than those who keep making the same mistakes over and over again. Good luck!